Chichicastenango is a town known for its Mayan markets. Market day is an experience you’ll not soon forget. 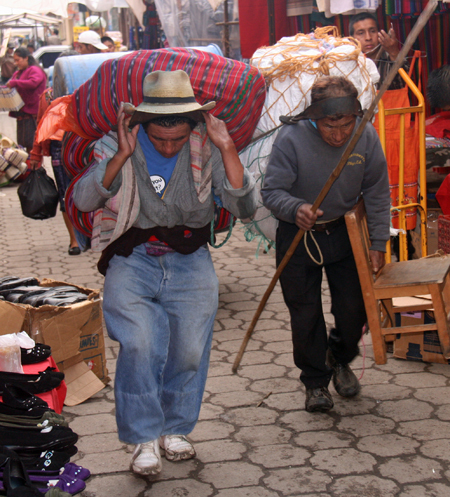 Locals go to buy produce and household goods and tourists flock to the markets to buy handicrafts and souvenirs. The town is in the beautiful Guatemalan highlands, several hours from Guatemala City. In order to fully enjoy the market we stayed in the beautiful colonial Hotel Santo Tomas. The market was to be found just outside the door and down a few streets. We checked in the night before market day and settled in to enjoy a welcome drink served by bartenders in traditional dress. The bar opened to the courtyard and marimba music wafted through the air. the old town. People walked with animals on ropes, carrying bundles on their heads and pushing overloaded carts. The hustle-bustle was worth getting up early for. Over at the gas station a group of photographers, all wearing khaki pocket vests and coordinating hats, were already snapping away. They stood out as giants among the smaller colorfully dressed indigenous Maya people. We headed down the busy streets to see the vendors setting up at the world-famous Chichicastenango market. It was a great time to go. The vendors were so busy setting up that they ignored us! The morning light provided us with a good time to take pictures. We made mental notes of where we might return for some serious shopping. We had our fill of early-morning photography and returned to the hotel for breakfast. By now, the sun shone brightly and the hotel’s colorful courtyard was graced with bright red and blue Macaws. Our guides, adamant that we understand the cultural context of Chichicastenango, made sure we got to the two main churches, Santo Tomas Church and El Calvario, which face each other across the main plaza (by now filled with market stalls). Santo Tomas is the older and larger one, while El Calvario is more like a chapel. 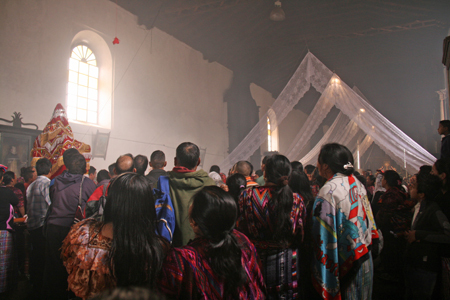 At these churches you will see both Catholic and Mayan ritual… and combinations of the two. While at Santo Tomas, we witnessed a Sunday morning Mass led by a priest and were surprised to see a trap door open in the high ceiling where a dove on a string was lowered over the parishioners to fly. Periodically confetti filled the room and members of a local cofraderia (religious brotherhood) got ready to bring a religious statue outside the church in a procession through the market. With draped lace, smoke from incense and prayers of the faithful, the experience was surreal. 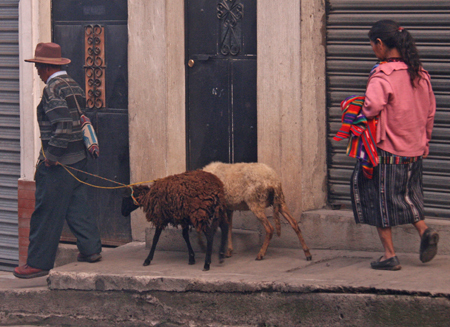 We knew we were within another culture… the reason we had traveled to Guatemala. Shopping the Chichicastenango market was an amazing experience. We stayed in pairs or threesomes to help each other navigate the maze of stalls, bargain with the vendors and, in many cases, fend them off. The Chichicastenango vendors are very assertive to put it nicely. They will follow you until you buy from them. The best tactic is to firmly say, “No, not today,” or “Gracias, No.” Repeating this many times and avoiding eye contact will give them the idea that you are not going to buy from them. It is hard to resist the young children with woven bracelets and pencils for sale. But you’ll find plenty to spend your money on, believe me! Our group loved textiles. Everything is either woven on a standing treadle loom or a backstrap loom. 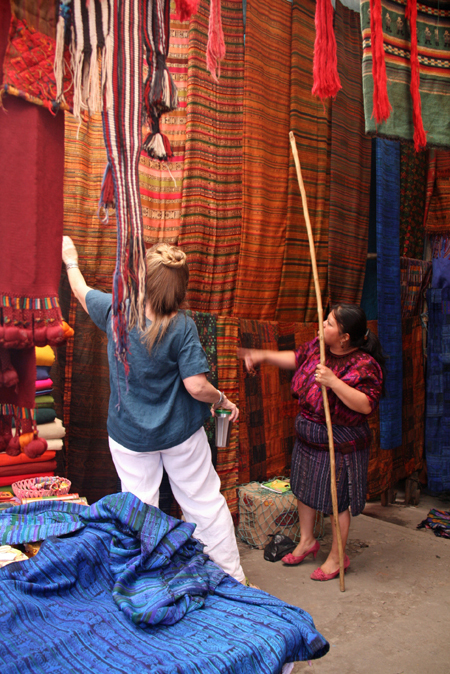 Beautiful hand-woven fabrics could be found at every turn in the market. One of our group wanted to make curtains, another wanted a shawl, and yet another used her woven art for a table runner. Chichicastenango is known for a special type of embroidery, found in the women’s huipil blouses and in some of the table runners. 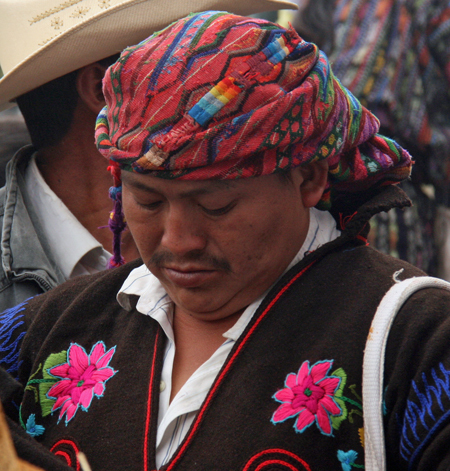 The Chichicastenango huipil is easily recognized by the circular embroidered “sun collar” neck trim. Also high on the popularity list with our group were the interesting coin and charm necklaces called Chachals. They were made with old Guatemalan coins from the 1800’s and older. Some had coral beads and milagros. They are made from coin silver. I paid about $30 for my necklace, after a bit of bargaining. I didn’t see many others at the markets in other towns. So if you want a coin necklace, consider one in Chichicastenango. After negotiating vegetable stalls, fabric stalls and much more, we were ready to sit down for a while. We had lunch at restaurant Posada de Santiago, right off the main Plaza. We dined upstairs, overlooking the market. The food was excellent and the chance to take a break from the busy market was welcome. After a leisurely lunch, we hit the market again. By now we had seen about everything and knew what we might want to purchase. Vendors were happy to oblige. We learned to go into the stalls, poke around the tables and jewelry cases. One of our travelers found a vendor with a case full of old coins, jade figures and very old looking treasures. She purchased some coins and a huge jade bead to make her own Guatemalan necklace when she returned home. Since we had a guide with us who knew the culture and language, we were invited into El Calvario to witness a fortune-telling ceremony by a Mayan Shaman who used stones. Lighted only by candles, the side room was quiet and the Shaman worked the stones and talked throughout the 15 minute ritual. He was paid and we left the church with yet another special memory. After a busy day at the market we walked the short distance back to our hotel and dropped off our purchases. It had been a full day. 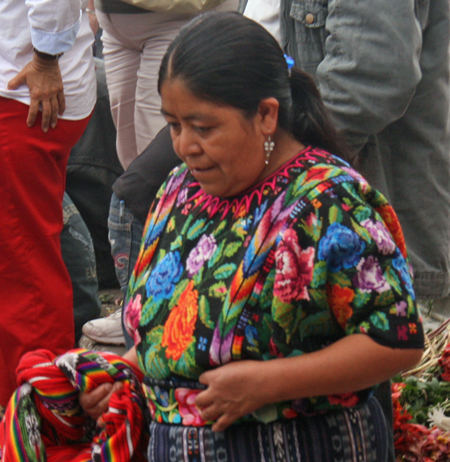 Woman shopping in Chichicastenango in traditional dress. Chichicastenango, also known as Santo Tomás Chichicastenango, is a town in the El Quiché department of Guatemala, known for its traditional K’iche’ Maya culture. Fondly known as Chichi, the town is easily reached by van from tourist destinations such as Guatemala City, Panajachel and Antigua. Adventuresome tourists might take a chicken bus. More on transportation in to Chichicastenango. Markets are held on Thursdays and on Sundays. We suggest that you go to the larger Sunday market as the cofradias (Mayan religious brotherhoods) often hold processions in and around the church of Santo Tomás on Sunday after Mass. We enjoyed staying in town the night before and the night after the market. While those nights can be noisy, it certainly was convenient.